A new team was created in February of this year to sell and support the Baylis NRG needle in the UK. Consisting of three Agents who are all specialists in medical devices and three support specialists from Dot Medical, the team will be able to support the usage of the Baylis NRG needle anywhere in the UK. Dot Medical started supporting the Baylis needle in 2009 and have since seen a rise in the interest level of Electrophysiologists. 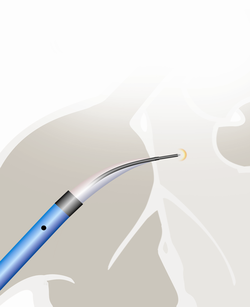 The Baylis NRG needle is used to make a hole between the right and left atria. Ordinarily this hole would be made using a steel needle. However, when a repeat procedure occurs (commonly called a re-do) the septal wall is often scarred and difficult to cross without a good deal of effort, and sometimes may not be crossed at all. The Baylis NRG needle is essentially a blunt insulated needle which has a 1mm exposed tip. A 2 second, 10 Watt electrical energy pulse is passed to the tip and the needle simply glides through the septal wall. In terms of crossing a heavily scarred septal wall, it is no more difficlut than crossing a non-scarred septal wall. In addition, there seems to be some evidence that standard steel needles can cause scraping, skiving, and coring, all of which could be detrimental to the well being of the patient during these procedures. The Baylis NRG needle has none of these disadvantages.